Allyson Fischlin joined the College of Agriculture, Food and Environmental Sciences’ advancement team in June as a director of development. She is returning to her native California after four years in Indiana. While in the Midwest, Fischlin worked at Purdue University as the director of development operations and donor stewardship for the College of Science. In this role, she was responsible for stewardship strategy, annual giving solicitations, donor event planning, and fundraising for diversity initiatives. She earned a bachelor’s degree in communication studies from UCLA and recently completed her master’s degree in public relations from Indiana University. Thousands of alumni and prospective students visited campus April 13-14 to learn more about the programs offered by the College of Agriculture, Food and Environmental Sciences. Students showcased the college’s many programs, offering interactive displays and answering questions. In addition, the 78th annual Poly Royal Rodeo was once again held in Cal Poly’s Alex G. Spanos Stadium, bringing more than 14,000 spectators to the rodeo performances. 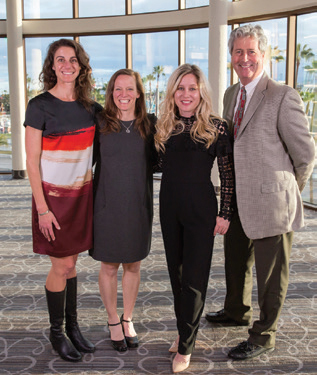 Professor Marni Goldenberg (pictured above second from the left), who teaches outdoor and experiential education in the Experience Industry Management Department, was honored with an Award of Excellence from the California Park and Recreation Society for outstanding research. 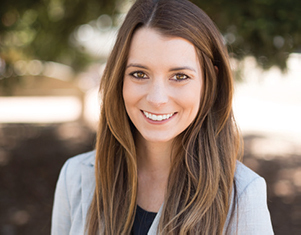 “The California Park and Recreation Society’s awards program is the highest recognition our department faculty can receive and it is credit to Goldenberg’s dedication to her scholarship, which has assisted our department in becoming a highly recognized and respected academic program across the U.S.,” Experience Industry Management Department Head Bill Hendricks said. Goldenberg’s research on participant motivation has spanned from skateboard and dog parks to Special Olympics and outdoor trails and marathons. Her research findings have been published in more than 25 books and journal articles and in more than 120 international, national, regional, state and local presentations. 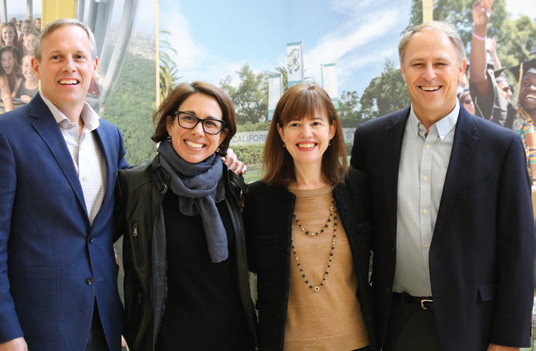 “She’s demonstrated her commitment to public parks and recreation not only through engagement at the state level but also at the district level,” said Keri Schwab, assistant professor in the Experience Industry Management Department. Since 2003, Goldenberg’s research has been accepted at all but one research symposium at the annual California Park and Recreation Society conference, a year in which she was on leave.